Forget getting the brews on, if you’re going to settle in for the night and listen to some auld beats why not try this delicious winter warmer. 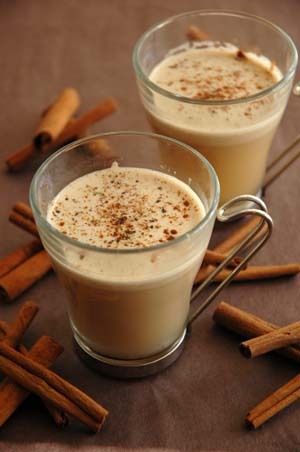 This recipe is not just any hot buttered rum it is the crème de la crème of hot buttered rum. This is far from the oily, butter smeared, watered down rum that you might have previously stumbled across. Let me introduce you to the only thing that will most certainly make our Aberdonian winter more bearable. Let the ice cream sit at room temperature until it’s the texture of whipped cream. In a mixing bowl, whisk together the butter, brown sugar and maple syrup, and ice cream until you have a luscious, thick, fluffy mixture, then add the spices, further whisking is needed until the batter is smooth and light, this should take five minutes or so. Your scrumptious batter is now ready for freezing. When you need that warm rum fix, just put two to three generous teaspoons of the mixture at the bottom of a mug or glass, add 25ml of rum (start small, you can always add more afterwards) with a small pinch of salt to lift the buttery goodness. Add boiled water to the mug of your choice, stir until the batter is dissolved, sit down in front of the fire or the PS3, put Yoins mix on and… relax.